Schwarzkopf Professional BC Bonacure Moisture Kick Shampoo is a moisturising micellar shampoo for normal to dry, brittle or curly hair. 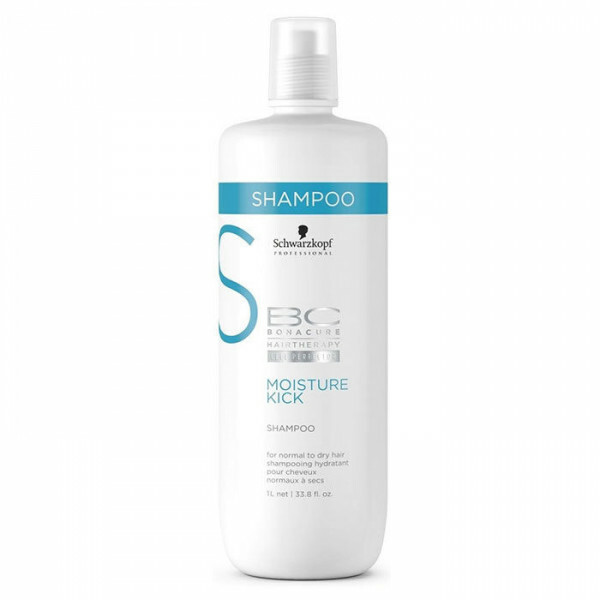 The silicone-free formula gently cleanses hair and scalp whilst providing additional moisture to prevent dehydration and deliver lightweight medium care. Perfect for hair that is dry, brittle, coarse, curly, wavy and normal to slightly porous. Gently cleanses scalp and hair while providing and binding moisture to hair. Free from sulfate and ammonia. Avoid contact with eyes. Rinse immediately if product comes into contact with them. Aqua (Water, Eau), Sodium Laureth Sulfate, Disodium Cocoamphodiacetate, Sodium Chloride, PEG-7 Glyceryl Cocoate, Hydrolyzed Keratin, Steardimonium Hydroxypropyl Hydrolyzed Keratin, Dimethylsilanol Hyaluronate, Panthenol, Citric Acid, Polyquaternium-10, Sodium Benzoate, Parfum (Fragrance), Butylphenyl Methylpropional, Linalool, Propylene Glycol.